Doing environment variables individually is not really a big problem when your App-V package contains only a few virtual applications in it; after all, you go and modify variable in one and then do it for few others. Not much time wasted, right? However, once you have a large package having number of virtual application in it, doing editing one by one becomes rather cumbersome. Mind you, the initial situation is fine as the App-V Sequencer automatically picks up new and modified environment variables from the monitoring stage, and then proceeds to add those to all virtual applications (OSDs) that get defined for that package. The issue becomes when you have to do any changes against those variables and you really – really – do not want to do sequencing wizard dance with the Sequencer (which, in 4.6 SP1, became even more convoluted for advanced sequencers when Microsoft decided to make it easier for newcomers), but rather would like to make quick point edit to the package. Not a task one would look forward to, is it? This is where new functionality in AVE 2.4 (and later) comes into play: we now have possibility to make virtual environment variable changes once and for all published applications in that package, which makes it significantly faster – as well as more reliable as you reduce possible typos during repetitive task – to quickly update large virtual application packages. 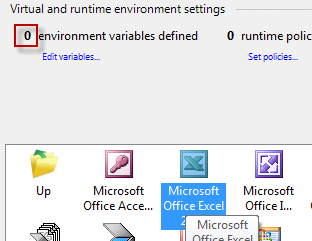 Note that even though we already have that one virtual environment variable defined for one published application from the previous example, the number of common environment variables shown here is zero (0). The reason for this is that when AVE looks for all the environment variables, it only counts those variables which are both set, and have an identical name in all of the OSD files. That is, if there’s same virtual environment variable in all but one OSD, it won’t be shown here at all since it’s not common to all virtual applications in the package. 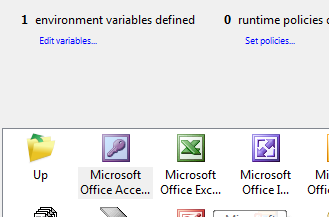 Only if the same variable is found in all the OSD files (regardless of the case of the naming since Windows itself doesn’t distinguish different casing in the environment variables), then it is considered by AVE to be a common variable and shown here. The variable is there as before, but the value has been changed into one we set at the package, as expected. We hope that by introducing this new feature in AVE, experience of editing big packages will be even more better as you now can “tweak” the variables quickly and conveniently from one single place, instead of needing to go and edit all published applications individually for the sake of even small change in virtualized environment variables!